Due to snow, the campground opening date has been delayed to Friday, April 12, 2019. Well off the beaten track, nestled in a beautiful mountain setting are the quieter, sandy beaches of Mabel Lake Provincial Park. Lush forests offer a pleasant retreat from the more crowded urban centres. The park’s sandy shoreline is backed by a cool forest of hemlock, red cedar and birch, in sharp contrast to the drier ponderosa pine/Douglas-fir forests to the west. Squirrels often visit the campsites and painted turtles can be seen at Taylor Creek. Deer, black bear and even moose can be seen occasionally as well as a variety of birdlife and water fowl. Mabel Lake is a fisherman’s destination park as several local fishing derbies are held in the park each year. It is not uncommon to find a handful of fisherman enjoying the peaceful spring months, fishing off the beach. Opportunities for rainbow trout are available here year-round. Mabel Lake can experience sudden weather changes. Boaters are reminded to find shelter in bays along the lakeshore in times of gusty winds. The lake bottom drops off steeply from the beach. Use caution. In the spring and fall, there is a lot of wildlife activity in the park. Please exercise caution and keep a safe distance. All campsite and group site reservations must be made through Discover Camping. When reservations are not available, all campsites function as first-come, first-served. Mabel Lake Provincial Park is one of the Okanagan's most popular destination campgrounds. During the summer months, the campground is most often full to capacity, occupied by reservations and on a first-come, first-served basis. Due to the remote location, all first-come, first-served sites are CASH ONLY. In order to accommodate guests who arrive to find the campground full, or who would like to overstay their reservation, an overflow area has been designated in an open field close to the boat launch. Tents are not permitted in the overflow area. When an overnight guest arrives at the park to find the "Campground Full" sign posted, we request that they proceed to the Host Site for overflow registration. If space permits, they will be assigned a camping space in the overflow area as directed by the Park Operator. Guests must be registered prior to proceeding to the overflow area. As guests vacate individual sites in the main campground, the open sites will be filled in the priority of the overflow list, as directed by the Park Operator. The Park Operator will advise overflow campers of their newly assigned site in the campground by 10 am each morning. Only guests camping and registered in the overflow area will be prioritized for placement into the main campground sites. If a guest is not registered in the overflow, they cannot register for placement into the main campground. Take Hwy 6 east from Vernon to Lumby. Follow signs in Lumby turning north onto Mabel Lake Road that follow the Shuswap River for 36 kilometres on paved road through a picturesque landscape of farmland and ranches and 1 kilometre of gravel road to Mabel Lake and the campground. The total distance from Vernon is 60 kilometres. History: Mabel Lake Provincial Park was established in 1972. The lake was named after Mabel Charles, daughter of a Hudson’s Bay Company manager during the late nineteenth century. Conservation: The area’s climate and landscapes mark the dramatic transition from the Okanagan Basin to the Quesnel/Shuswap Highlands. To the west, the slopes of the Thompson Plateau are covered in Ponderosa pine and Douglas fir, while on the east side of Mabel Lake the wetter and steeper slopes of the Shuswap Highlands grade into the Monashee Mountains. For visitors accustomed to the dry Okanagan forests, the cedar and hemlock of Mabel Lake clearly indicate the greater rainfall in this valley. Wildlife: Squirrels often visit the campsites and painted turtles can be seen at Taylor Creek. Deer, black bears and moose can be seen occasionally as well as a variety of birdlife and water fowl. There are paddling, canoeing and kayaking opportunities at this park. This is a fairly large lake (35 km long) and subject to sudden weather changes. Paddle near shore and explore the extensive shoreline if the weather is poor. The lake is also popular with motor boats. The short, 1 km “Changing Rainforest” self-guided interpretive trail winds through the shaded forest carpeted in moss that is found between the campsites and the main road. It is a gentle hike taking visitors through the maturing second growth rainforest of western red cedar, hemlock and some Douglas fir. The hike takes 30 minutes. There is a designated beach area for dogs between the boat launch and the swimming area. In all other areas of the park, pets/domestic animals must be on a leash at all times. Please remember you are responsible for their behavior and must dispose of their excrement. Backcountry areas are not suitable for dogs or other pets due to wildlife issues and the potential for problems with bears. Mabel Lake is a great spot for swimming. A very large fine sand beach provides the perfect place to warm up and dry off or just relax in the sun. The beach is separated from the lawns of the day-use area by cottonwood trees and is easily accessed from both the day-use parking lot and the Trinity Campground. Another smaller beach is found next to the Monashee Campground. The sand is more coarse but still a great spot for swimming. Both areas are marked with buoys but there are no lifeguards on duty at provincial parks. Mabel Lake is a good spot for waterskiing, though not a destination. The boat launch facilities are sufficient for a variety of boats. There is an abundance of wildlife in the park that makes for good wildlife viewing, especially in the spring and fall. There is a double wide concrete boat launch that slopes gently into the lake located at the southern boundary of the park beside the Mabel Lake Marina. There is a large 60 square metre wooden dock with rubber bumpers and pilings. Ample parking is available in the gravel parking lot. 10 angled spots for trailers are designated with cement barriers and there are also spaces for trucks with trailers. A turn around area near the launch makes backing up easier. While campfires are allowed and campfire rings are provided at each campsite, we encourage visitors to conserve wood and protect the environment by minimizing the use of fire and using camp stoves instead. Firewood can be purchased in the park or you may bring your own wood. Fees for firewood are set locally and may vary from park to park. Limited burning hours or campfire bans may be implemented. To preserve vegetation and ground cover, please don’t gather firewood from the area around your campsite or elsewhere in the park (this is a ticketable offence under the Park Act). Dead wood is an important habitat element for many plants and animals and it adds organic matter to the soil. There are eight cold water taps in the park, centrally located in each campsite loop as well as at the day-use parking area and in the group site. Water is from a well. Taps are shut off during the off-season. This park has a large day-use/picnic area extending from the Trinity Campground to the boat launch. The lawns are level, open and spacious, providing the opportunity for a variety of games. There are 10 picnic tables amongst the cottonwood trees that separate the lawn from the beach and provide some shade. The tables have a great view of the lake and the adventure playground. Two flush toilets and a tap are located next to the playground. Five more tables with three fire rings are found nearer to the boat launch, also surrounded by open, spacious lawn. There is a gravel parking lot with 45 spots. Two pit toilets and a tap are located in a small patch of shrubs just off the parking lot. Depending on water levels, it is possible to walk the beach the entire length of the park from the boat launch to Taylor Creek. Taylor Creek braids and forms a delta as it enters the lake. Sandy floodplains form underwater as the light sand settles out of the stream in miniature example of the geologic process that formed many parts of the Okanagan Valley. This park has 14 flush toilets also located in each campsite loop as well as at the day-use parking area and in the group site. There are 2 pit toilets in the day-use area. This park has a popular nature inspired deluxe playground. The playground is just off the day-use parking lot. A sani-station/dump is located at the entrance to the park across from the service area and information shelter. Drinking water is also available at the sani-station. It is available during the collecting season from April 1- Oct 13. 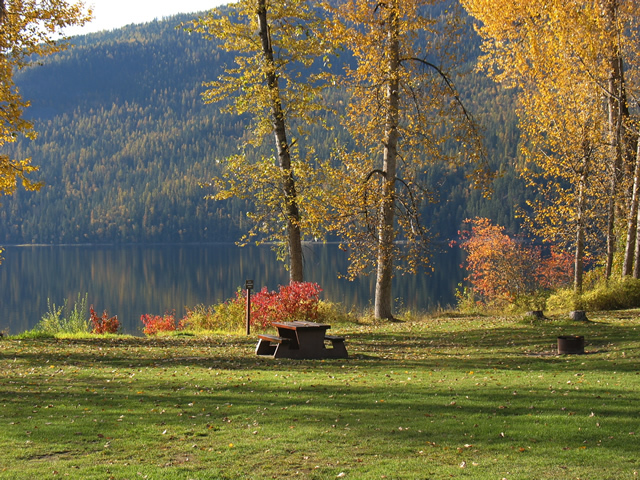 This park offers 84 vehicle accessible campsites in two campgrounds: Trinity and Monashee. The main gate located at the park entrance is locked between 11pm and 7am during the operating season. The main gate is open to the boat launch but the road is not maintained during the off-season. The Trinity Campground consists of sites 37-84 arranged in three loops and includes four double sites. The roads are single lane gravel. This is the first campground encountered when driving into the camping area. The loops are set in a thick forest of cedar and hemlock that provide shade and privacy with a forest floor carpeted in moss. The loops are separated by open grassy areas and linked by a trail that runs the length of both campgrounds. The sites consist of medium to large gravel spurs that have been raised and levelled. The abundance of trees may make parking difficult for some large RVs. The Monashee Campground consists of sites 1-36 arranged in two smaller loops and includes eight double sites. The sites are generally smaller than those in the Trinity Campground and the forest is thicker allowing for more privacy. There are more double sites but these are also smaller and perfect for trucks with campers. The sites are gravel but not raised. There is no phone or cell service in the park and the closest store for snacks and other small items is right next to the boat launch. For more services, Lumby is the closest community. Vehicle Accessible Camping Fee: $23.00 per party/night. Due to the remote location, all first-come, first-served sites are CASH ONLY.